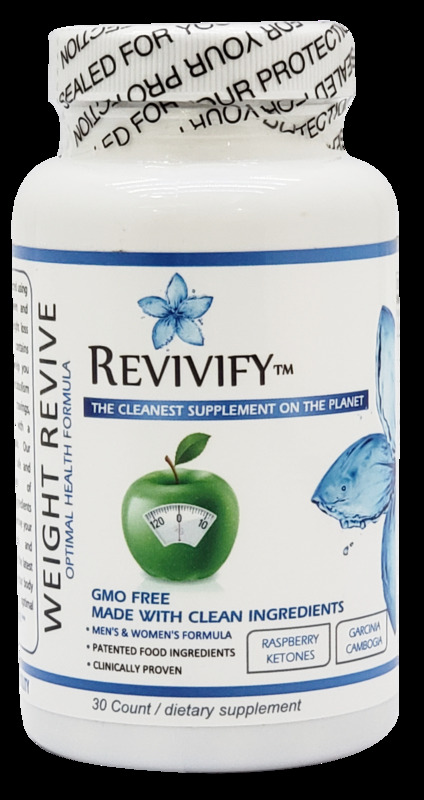 WEIGHT REVIVE is formulated using the most clinically proven and reliable ingredients in weight loss today. Our formula contains powerful ingredients to help you burn fat, increase your metabolism and prevent food cravings, especially when paired with a healthy diet and exercise. Our proprietary blend is a safe and effective combination of scientifically proven ingredients that will dramatically improve your weight loss success and sustainability. Stop using the latest fad stimulants and help your body restore its natural and optimal health with WEIGHT REVIVE! Garcinia Cambogia – Increases fat oxidation to help burn through fat stores and prevents fat accumulation in the liver, while the rind of the garcinia fruit has been used for centuries to stimulate a feeling of fullness. Raspberry Ketones – One of nature’s best fat burners. Raspberry ketones accelerate lipolysis to help your body burn fat quickly, before it can accumulate around your belly. Raspberry ketones also help the body regulate adiponectin, one of the proteins that govern your metabolism. Green Coffee – Contains both chlorogenic acid and natural energy sources, two important components for weight loss success. Together, these ingredients encourage lipolysis to help your body burn up fat before it can be stored and increases your energy levels to make you feel less hungry. Green Tea – Contains polyphenols to induce thermogenesis and stimulate fat oxidation to help you burn fat and lose weight. Green tea catechins have also been shown to lower LDL (bad) cholesterol.